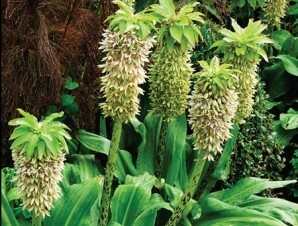 A spectacular plant, with spikes of purple-edged, pale green star-shaped flowers on purple-spotted stems in July and August, topped with a pineapple-like tuft above a rosette of wide, fleshy leaves. 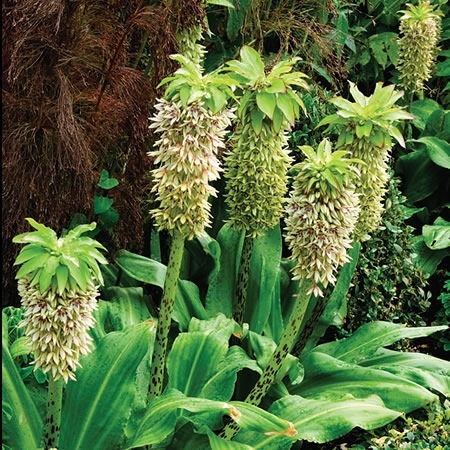 This distinctive, summer-flowering bulb looks stunning planted in clumps in a large, well-drained container or in a sunny, exotic-style garden. Since it’s not fully hardy in frost-prone areas, it’s best over-wintered indoors in a cool greenhouse, though we are trying it out in a well drained bed here at Lewis Cottage as a trial! Categories: E-H, Featured Plants, Plants A-Z, Plants by Season, Plants In Situ, Summer, The Pot Garden.